Our team was looking for a best Cezanne Treatment in Manhattan. We were happy to find Oon Arvelo Salon and rushed there for a service. 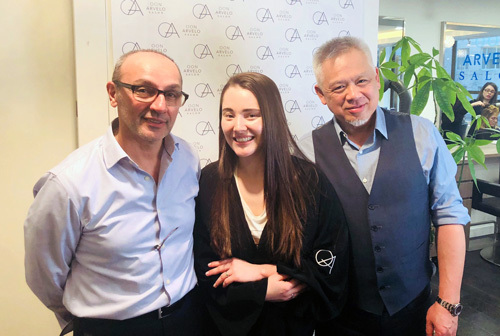 We met with the salon owners and their dream-team to get our hair done and disscused new hair trends. Albert, tell us how your hair-color beauty journey began? I came to New York to work in theater. I studied dance, singing, and acting. I did fashion modeling as well. As we know this work can come and go, so I wanted a backup for the lean times. I decided to learn about hair with the idea that I would work behind the scenes as a stylist for film and TV. I finished beauty school but learned that I’d be looking a long apprenticeship for the union. Once I started working in salons, I learned about hair color, and the rest is history. I could express myself in a creative way, and also learn the science of color. I enjoy making up potions that change the structure, color, and texture of the hair. What’s your favorite coloring technique? I’ve always liked doing single-process color. It’s fascinating to see what a simple tweak of color can do to a person’s look. It goes back to why I like hair coloring. You can imagine a new look, but you need to do science to get there. I enjoy creativity and logic in that mix. What is the most popular coloring service these days? Single process color is by far the most popular service these days. When I was starting out, someone advised me that everyone is going to get grey hair. In our youth-oriented society, women are not allowed to age. Nowadays, even young people want to experiment with different colors. And let’s not leave out the men. It’s not unusual to see the fellas in the salon for a little blending. Is Cezanne treatment formaldehyde free? Please know that Cezanne is formaldehyde free. It’s not in the bottle, and it’s not released under high heat. How long will effect last on mytopface experts hair? The treatment lasts from 8 to 10 weeks. This, of course, is with proper care at home, using the proprietary shampoo and conditioner. Some clients extend the life even further depending on how often they shampoo. Does it have a combined effect? The more you do the better? As with any salon service, one should keep regular appointments. There is always a residual effect. The more you do the Cezanne Treatment the healthier the hair becomes. Especially if it’s over highlighted or otherwise damaged. How often can you do this treatment? You can do the service as often as you like. Most people book every 3 to 4 months. 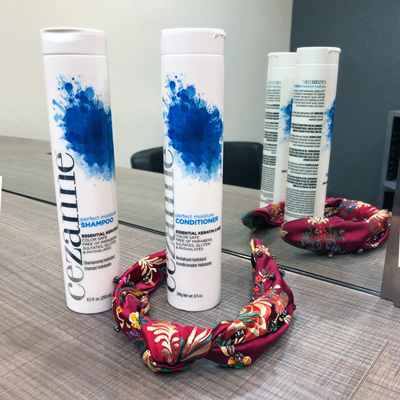 Albert, you said that hairstylist should shake well bottle with Cezanne products? Why? Many salon products need mixing in order for all the components work. Cezanne is no different than the others. How long does it take to provide Cezanne treatment? them squirming in the chair because they need to rush to their next engagement. Is this treatment safe for breastfeeding or pregnant women? I’m not a doctor, but, the treatment is safe for a pregnant or breastfeeding woman. The product is not applied to the scalp, and there are no harsh fumes. Any concerns, speak to your health provider. What are the do’s and don’t after the treatment? 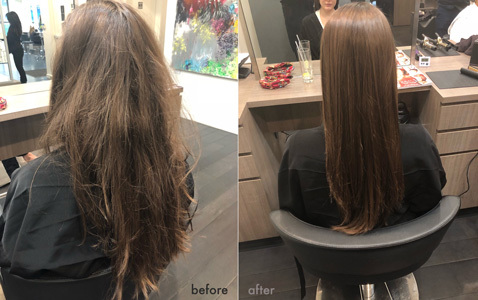 The reason I choose Cezzanne is that the client doesn’t have to think about the hair after the service. One can style, shampoo or color right after the treatment. Remember to use the right products as mentioned above. 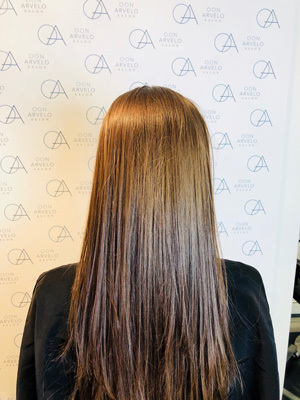 What are your beauty hacks /recommendation for clients who want have a gorgeous, long hair? I am from the Mies van der Rohe school of hair, “less is more”. Especially if the client wears the hair long. The ends can be with you for 3 years or more. Long hair needs meticulous maintenance. Regular shaping by an experienced cutter. Always smooth with a good conditioner after shampooing. Invest in a hydrating mask, use it 2 to 3 times a month. As for color, stay within 2 levels of the natural. The science of hair color has come a long way over the years. My services are more like a treatment. The hair should look healthy and shiny after a salon visit. Sometimes virgin hair that is dull looking can enjoy a color gloss in the salon. We now have products that add a gloss with no perceptible change to the natural hair. It’s color without commitment. Which brings us back to Cezzane. This treatment is for anyone who wants to tame the frizz. It will shorten styling time, help increase the health of the hair, and feature killer shine. Don’t forget my motto, “The best-dressed tresses appear effortless”! Peter &Elvin: How your hair-beauty-journey began? Peter: Honestly It was by accident (lol). I originally began in art school, however life happened and I found out that I was having a baby and needed to find work. I went into vidal sasson for a haircut for an upcoming interview I had and there they were prepping for a fashion show. Immediately I fell in love with the site in front of me. The beautiful woman, the styling, the fashion it is then my interest began in the hair business. Elvin: Ideally I wanted to be a cop, at that time growing up in Milwaukee they were looking for Latino cops. After attempting to apply I was turned. One day during a haircut my barber suggested I try being a barber myself. I declined at the moment and continuing seeking employment elsewhere, I then tried tech school but there was a 2 year wait. Again the same barber suggested beauty school. Immediately I said no way, mainly because in my neighborhood at the time they tend to turned there backs to men in the hair business suggesting it was a girls type of job. This time, I considered his suggesting and after seeing other men there at beauty school I felt more comfortable. After finishing school I worked at a hair salon after school and landed a job in one of Milwaukee’s top salon. 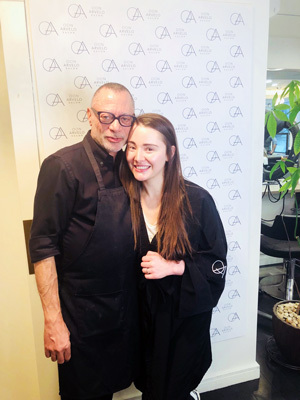 After meeting tons of people my move to New york was to work with Fedrick Fekkai .This is where my beauty journey began. Peter: Me and Elvin always had a vision, on how to run a salon. We wanted more customer service and high standards. Some salons I’ve noticed have talent but lack customer service and vise versa. We wanted a salon where we had both, and we realized then that the only way to accomplish this was to open our own salon. Elvin: Peter and I wanted our own way of doing things, bring our own culture into one salon. We both felt we wanted the same thing and shared the same ideas therefor pushing us to open the salon together. Please tell us more about the salon, its story, and location. Peter: The location of the salon wasn’t important to me it was the people that would be working there that I cared about. The design of the salon was to be an open space, where clients can see us mixing colors, as most salon have their dispensary hidden. We like to see each other work as well. Think of it as an open kitchen, thats the feel I wanted to give clients. Elvin: The story is looking for the place (lol). When we found this one I was initially hesitate at first, peter however liked it. I wasn’t too certain about the location, but felt that the design could make it better. We wanted the salon to be opened, Large windows in the front, so that clients can see out and pedestrians can see inside. The stations are open as well so that we are able to see each other and always know whats going on. Whats your favorite hair trends for now? Peter: I like that elegance is coming back, more glamorous hair. Less pastel and ombre. Elvin: I’m currently liking the textured Bobs. Unstructured and messy, kinda like its been lived in. Peter: Everyone to look as good as they can. Color is customized for each individual person. I want to bring out their personal best! Elvin: My ultimate goal is to ensure everyone that leaves my chair feel the beauty they possess. Do you have your own hair hacks for clients who want to have healthy /gorgeous hair? Peter: No need to buy expensive conditioner if it is used correctly. One hack is Before you shower, shampoo your hair FIRST! after shampooing, take out all excess water, towel dry if necessary then apply conditioner only on the ends and gradually work it into the scalp. Then tie up into a bun and then shower, usually most take hot showers. So leaving conditioner while you shower allows the steam to help the conditioner penetrate the scalp. This way you are getting the full benefit of the conditioner. Elvin: The dryer sheet hack, especially winter time when static comes about. Gently brushing them down with a dryer sheet can actually keep the flyaway in its place. Another great one is if you run out of any moisturizing products, serums etc after you’ve finished styling. Body moisturizer works just as great! It can even define curls, make sure to use a small amount and rub it between your fingers and palm before apply to the hair. For the first time we featuring salon where clients can get multiple services at the same time! It’s a great idea for Manhattans busy ladies! Tell us what services can you mix? Peter & Elvin: We try to accommodate our clientele with a busy schedule by allowing them multiple services at a time such, Mani and Pedicure during their color appointment. Manicures during their blow dries. Waxing services done while color is processing. A makeup touch-up while getting a blow dry and of course manicure while makeup is being apply is a great way to save time too! We even give the option of express check outs! 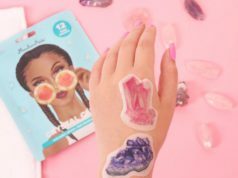 What’re your favorite brands for hair care? Elvin: Phyto, Oribe and Milbon. Any tips/tricks for our readers? 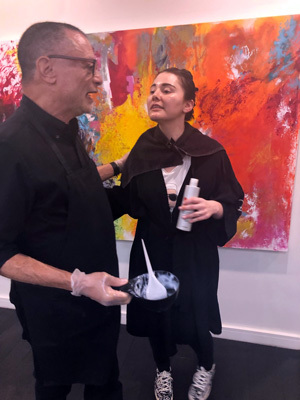 Peter: Conditioning the right way can prolong your color and seeing your colorist between your color appointments for a gloss, can keep the color vibrant healthy and shiny! 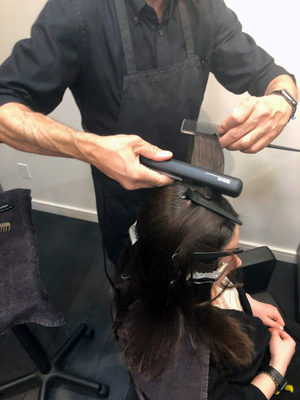 Elvin: Bringing a photo in of what you desire to achieve with your hair can ensure both you and the stylist/colorist have a common understanding of what you want. It can even help you determine if that stylist is a good fit for you or not. I also suggest purchasing the exact products that your stylist used on you so that it may be easier to recreate at home. You can never go wrong. 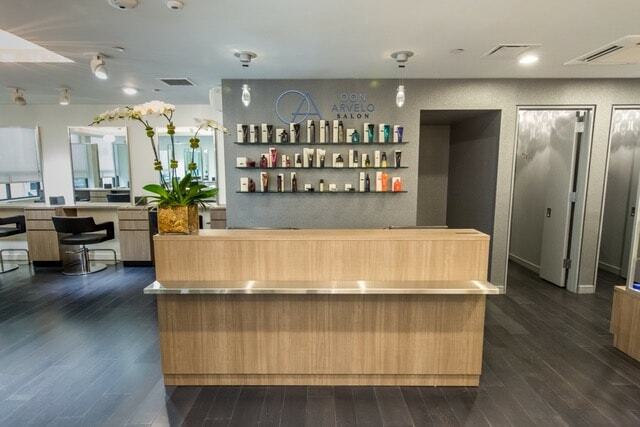 If you want to be perfect from toes to hair and receive luxury services in the heart of Manhattan you should definetly visit Oon Arvelo.